Do healthy arteries equal a healthy brain? Our group has been intensely studying how vascular and cognitive health intersect. The clustering of cardiovascular risk factors and insulin insensitivity, known as metabolic syndrome, in a single individual is a growing public health concern. We are trying to understand the impact of metabolic syndrome components on vascular health, brain structure and cognitive function. We are nearing completion of a three year cross-sectional study looking at every day people in midlife. In two separate visits we assess their vascular health with vascular ultrasound and cognitive structure and function using functional MRI and paper and pencil tests. By characterizing vascular and cognitive health, we can specifically look at the ways they are related. Does regional body fat impact brain blood flow? Is being more aerobically fit related to higher cognitive function? If so, which domains of cognitive function are related? These are just a few of the many questions we hope to answer. Ultimately, we will find out which metabolic syndrome risk factors have significant consequences on cognitive health, and specifically learn which domains are most impacted. With the growing amount of children and adults not meeting physical activity requirements, in addition to the growth of the United State's aging population, the amount of vascular related cognitive impairment and Alzheimer's disease will inevitably increase. The associated economic and social burdens associated with these will only rise according. By investigating the relations of vascular and cognitive health in midlife, we can shed light into which modifiable risk factors can be targeted to assuage their deleterious effects before clinical symptoms emerge. 1. We will first complete our data collection towards the end of this calendar year. We are approximately 40 participants away from reaching our study recruitment goals. 2. We are continuously organizing our data into a format for comprehensive, easy, and swift analyses. 3. We will write multiple peer reviewed manuscripts answering questions similar to those stated previously. Each manuscript will pose a unique question and analysis. Despite having incredible access to complex modalities, it is essential our team of graduate student researchers have continuous access to statistical software. The entirety of the budget will go towards purchasing a statistical software package for the two lead graduate students. This will allow them to easily test new hypotheses as they arise while ideas are fresh. In return we will happily engage in ongoing correspondence via email about the current hypotheses we are testing and give an inside scoop on how the data are looking! Evan has been performing clinically related research for 6 years. He earned a B.S. in Exercise Science from Skidmore College in 2009 before working as a research technician at the Tufts University Jean Mayer Human Nutrition Research Center on Aging in the Nutrition Exercise Physiology and Sarcopenia laboratory. He has since moved to Austin, Texas where he earned his M.S. 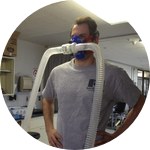 in Kinesiology and is now beginning his doctoral work at The University of Texas at Austin. He is currently the lead researcher on a collaborative project between the Cardiovascular Aging Research and Clinical Psychology Laboratories. The lab members on campus. Hook 'em! Performing transcranial doppler during a cerebrovascular reactivity test.